Born in Asia, adopted in Poland, developed in Holland and Poland. The variety of the breed is amazing. The origins of the breed's name are uncertain. The breed could have been named after the country of Poland. Its name also could have come from the Middle Dutch word pol, meaning "head", in reference to the Polish's dome-shaped skull. Though the derivation of the Polish breed is unclear, one theory suggests that their ancestors were brought by Asian Mongols to Eastern Europe during medieval times, and thus, could have originated in Poland. It is also believed that immigrants could have brought the breed's predecessors from Spain or Italy in the late 16th century. The Polish was standardized in the Netherlands and declared a thoroughbred in the 16th century. Chickens bearing a strong resemblance to the Polish can be seen in paintings from the 15th century, and the breed was extensively portrayed in Dutch and Italian paintings from the 16th through the 18th centuries. Though usually only a fair layer at best today, In France they were once known as an excellent producer of eggs. 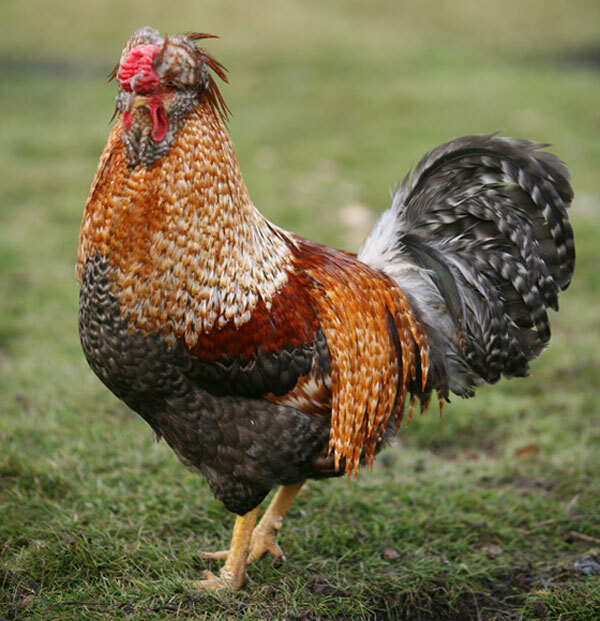 The American Poultry Association states that the breed was introduced to America between 1830 and 1840. 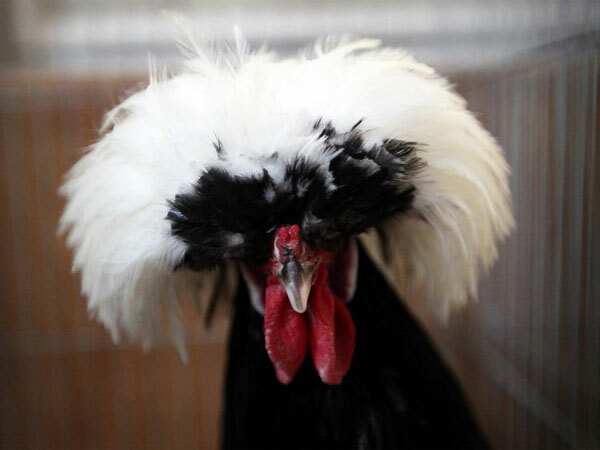 The breed was, during a certain period of time, favored by American farmers and chicken fanciers. The American Poultry Association accepted three Polish varieties into the American Poultry Association’s Standard of Perfection in 1874; additional varieties were accepted in 1883, 1938 and 1963. 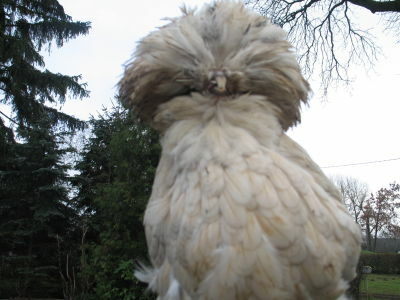 There are some controversies around origin of the Polish chicken's breed. Some state that the breed has Polish origin. These doubts might have arisen due to generally limited access to original sources documenting the Czubatka's (Polish chickens') presence in the history of Poland, caused by the fact that these testimonies are available in Polish language only. 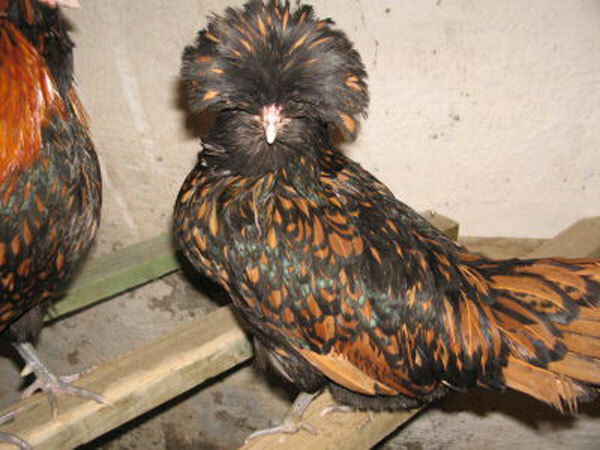 The Polish chicken breed's original, i.e. Polish, name is: Czubatka (ˈtʃubætkə). 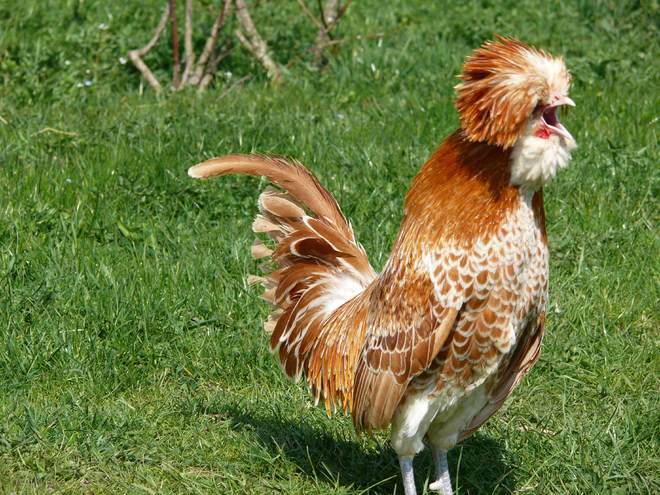 For centuries Poles kept their Czubatka domestic fowls in small farms scattered all over Polish territories. 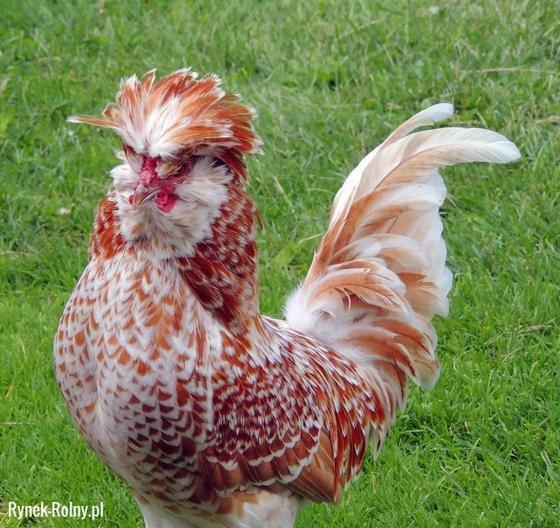 The full name of Polish chicken is 'Czubatka Staropolska' or 'Czubatka Dworska', where in Polish language 'Czubatka' simply indicates a hen or rooster with 'czub' (a tuft of feathers growing on top of the head), the word 'Staropolska' is an adjective meaning 'old-Polish' and the alternative nickname 'Dworska' is an adjective meaning 'court'. 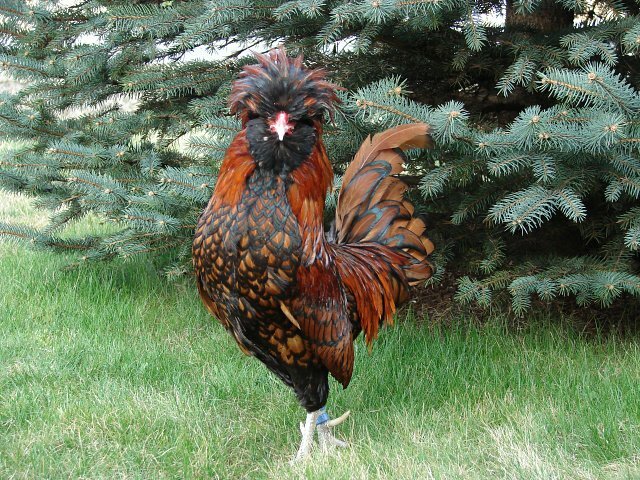 The Czubatka has multiple representations in Polish literature and art, and the Czubatka rooster is an iconic image symbolizing a country gentleman - character. To wind down, it is worth to mention, that the Czubatka poultry had been looking and behaving exactly like the contemporary Polish chickens do today for long (first accounts come from Middle Ages) before it was firstly introduced to Dutch breeders as the Polish chicken. I've actually seen one of these chickens here in the U.S. When I was a child, we would visit my aunt and uncle at a summer house they had on the coast south of Boston. One summer, some workers were paving the dirt road their house was located on. One of the workers had a sack with a chicken in it that he had put down on the grass with his lunch, etc. The chicken kept poking its head out of the sack. It was so strange looking to us, that we asked the worker what it was, and he told us, "A Polish chicken." It looked like the ones in your photos! Funny story. 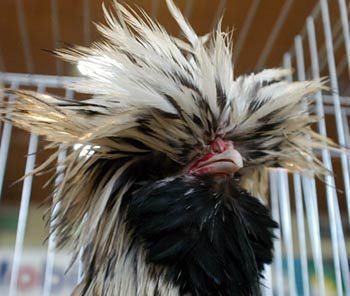 Instead of a pig in a poke (in the Polish proverb - a cat in a sack), he had a Polish chicken. A poke is a sack or bag. It has a French origin as "poque" and, like several other French words, its diminutive is formed by adding "ette" or "et"—hence "pocket" began life with the meaning "small bag". Poke is still in use in several English-speaking places, including Scotland and some regions of the USA. For example among English hop growers, a poke is a large sack into which hops are poured to be taken from the picking machine to the oast for drying. Great explanation of the word "poke!" I had no idea of that word's origins or what it really meant! And I love these expressions that have arisen from the word! Thanks for posting! I strongly recommend you to read it. As a student, I read his encyclopedoia of world culture and got B at the Polish oral final exam. I remember that in my childhood we went to the Polish countryside, and that as a child I together with my sister Carine used to connect and play with a Polish boy who was thew son of a Polish farmer. I remember that I was impressed by the huge white Polish chickens on the farm next to the Hens, wild turkeys and geeze. In my imagination these Polish white chickens were enormous, but it could be that I was young. The nice thing about the Polish farm was that it was quite old fashionate (different than the modern Dutch farming which was much more mechanised), and thus had a certain charm and romantic feeling to it. It was in the village Wilga, a village in Garwolin County, Masovian Voivodeship, in east-central Poland. You had to watch out for the geeze, because they could be aggressive as guard dogs, but also the chickens could nasty pick you. 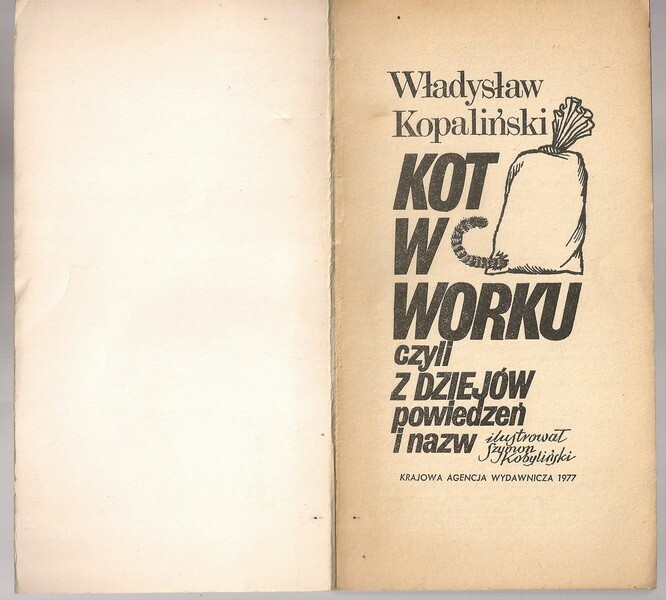 The ambition of the Polish farm boy in the Communist Peoples republic was to become a Capitalist in the future. I hope he has become a successful farmer capitalist in present day Poland. I hope that in Poland you still have some natural farming, and that not everything has become so large and polluting like the Dutch agricultural sector. The mass production of meat in the Netherlands (chickens, and especially pigs and cows) is one of the most polluting factors in the Netherlands. The animal farm branch of the farming industry produces a lot of Ammonia. The crop production farms in agriculture use a lot of Pesticides. Climate change has the potential to affect agriculture through changes in temperature, rainfall (timing and quantity), CO2, solar radiation and the interaction of these elements. Extreme events, such as droughts and floods, are forecast to increase as climate change takes hold. Agriculture is among sectors most vulnerable to the impacts of climate change; water supply for example, will be critical to sustain agricultural production and provide the increase in food output required to sustain the world's growing population. The source of the last paragraph is wikipedia. My first 20 years I grew up in the periphery of a small city near the country side with a lot of farms nearby. In my school and class were farmers children, next to the kids of sailors, fishermen, and parents who worked in the harbour, the Dock yards or for the muncipality. The smell of farmwork and farm life was always there. In the North of our house was the city and in the south the rural farmland of the Zeeland (Walcheren) farmers. I loved to play on the farm land as a child and to pick up little potatoes after the harvest. I am afraid Polish farmers are not different than the Dutch ones. Yes, they use less chemicals in fields, but it is attributed to their backwardness, not caring about environment and health. You spent 20 years in the vicinity of farms, in result you appreciate urban life today. I spent my first 20 years close to the city centre but we visited our family in the countryside from time to time, in result I am fascinated with rural life today.